It’s ages since I wrote anything about what I’ve been up to musically. Although I’ve been really quiet, I’ve been pretty busy, apart from when I was decorating a room at Dad’s house. I thought at the start of the summer that I’d be doing another Tune-A-Day-June, but was feeling really burned out and decided not to go forward with it, because it gets pretty exhausting anyway. Instead, it’s been a summer of collaborations, starting with a single that I worked on with another producer I met on Drooble. That hasn’t come out yet, as there are some admin type things that need sorting out before it’s released, but it’s finished and ready to go when we are. Then there has been a track I’ve been helping Matt Steady develop for his upcoming album.It’s my return favour for Matt playing pipes on Home to Roost. I’m not sure quite how much of the specific detail I am allowed to reveal here, so I’ll avoid giving too much away, but it started out with me being sent an Uilleann pipe melody – just by itself, apart from a sound effect that ran under it. I figured out some chords for it, added a beat and synths, then it has bounced back and forth a bit ideas-wise, with Matt adding more layers with various instruments, switching the arrangement up, and me commenting on progress. Along the way, quite early on in the process, it turned into two separate tracks, in order to incorporate more of the ideas for where it might go. It’s looking like I will get a final stab at the track to push the synths further on, once the drummer has recorded real drums to it, now that the structure and arrangement of the piece is so much more fully developed. I’m really looking forward to being able to hear the final version & for it to be released. Something else that has been happening is the remix I started doing for John Clark. I had a selection of possible tracks for remixing and couldn’t decide which one to go with, and started playing with several different tracks that John had provided the audio for. That indecisiveness meant it has grown into an EP project, with me doing some vocals on the songs, too, as John was quite keen for that to happen. That project is about half-way to two-thirds complete, depending on whether it grows again before it goes out! There are a few more collaborative projects simmering as well, plus some tracks of my own I was originally hoping to release during the summer before I realised quite how burnt out I was after the album release. It’s looking like I’ll be doing well to get those out as an EP during the autumn at the moment, but let’s see. With Dad doing a lot better and dropping hints that I have my own life to get back to, I’ve felt able to concentrate a lot more on finishing my started music – punctuated by a few medical appointments that I’ve provided transport for and just keeping an eye out to make sure things are as OK as possible. A couple of days ago, I submitted my second album to the distributor after a very intense few weeks, fixing the odd issue with the mixes and mastering the tracks. The next stage of ‘inspection’ has been done by the distributor and I’m writing this whilst I proof-listen to the tracks in order to give my final permission for them to go ahead and release it EVERYWHERE – i.e. the point of no return. The official release date when it will start becoming available to the general public is this coming Friday, 18th May. This is the first time that I’ve released a project I mastered completely by myself. I can tell you categorically, having gone through it, that doing your first ‘official’ mastering on a 15-track album is nothing short of stupid! I had thought I might release a self-mastered EP first, as that’s what I was learning on, but ended up concentrating on the bigger project because I thought I had, ahem, mastered it enough. Hindsight is a wonderful thing, isn’t it? Mastering a single track is relatively simple – you don’t need to think about how the sound relates to anything else apart from reference tracks that you’re using as a guide. You just make sure it sounds as good as those, adding a bit of polish, and ensuring that it is at the right volume level. * With every additional track in a project, however, you are adding a layer of complication, because they all need to sound right together. That meant that I had significantly more attempts at mastering each track than I would have had if I’d been releasing 15 singles separately. There was also an element of still being on the uphill part of the learning curve, which would have been fine if I was releasing a 4-track EP, but it made releasing an hour-long album more ‘interesting’ when working to a deadline I’d by now committed to. Perseverance and overcoming stress is really important for releasing music! And just to prove it, before I get all the way through proof-listening to the whole album, there is some kind of technical fault – the distributor website suddenly can’t load my audio files. Maybe they have a server down or the site is overloaded at present – tracks I already listened to won’t load either, but the internet hasn’t gone down (this time! it’s been really wonky for a couple of days). I’ll need to come back later and have another go, by the look of things. At least it’s fallen over on the most appropriately-named track, Ominous Hopeful! *OK, so it’s a bit more technical than that, but that’s the short version and it all boils down to using your ears and a few meters to get the best possible outcome. Today’s POTW, Girls Who Can, is compiled by CeCe Hemmingway, one half of British electronic act Hemmingway. Based in Chelmsford, Essex, the band have a big, contemporary, sound bridging the gap between electronica and guitar based rock, with David Moriaty’s cutting solos. It’s worth pointing out that CeCe not only provides the vocals, she’s also a skilled music producer, as you will hear on tracks such as Rise Again. In fact, all the tracks on this playlist are produced by women: let’s hear it for the girls! After a couple of weeks where I was getting a lot of other things done – like researching what to do if Soundcloud suddenly disappears (and actioning what I found out) – I’ve managed to make another dent in the heap of significant things-that-need-doing to finish a second album. I’m not 100% sure that Of Space & Time will actually fit in with the rest of the album, as it’s steadily becoming more and more of a triphop album, but we’ll see. I might have to hold that one over for the next project, depending how weird the mix of tracks seems once I have enough tracks for some to be considered ‘spares’ towards the end. As ‘No. 1 Fan’ was disappointed that I didn’t include Solitude in Numbers in the Sleepwalker album, I have sent her a mix to see what she thinks. (And to prove I’m really going to include it this time!) It was one of the first tracks for the first album, and No. 1 Fan had heard my first mixes. I felt pretty bad about leaving it off when I saw her reaction, but it wasn’t in good enough shape to go on Sleepwalker. Solitude in Numbers is the song that wouldn’t completely behave itself, no matter what I did to it. I hadn’t learned to mix when I put the first version together, which certainly didn’t help. The mood of the initial mix was upbeat and poppy, and although I’m all for sad songs sneakily hidden inside happy tunes, it wasn’t working, even after a remix. So a few months back, I started to record the song again completely from scratch, slowing it down a bit, and making the arrangement incredibly sparse this time, whereas the original version had been crammed with all sorts of unnecessary sounds which only served to make the track more difficult to pull together. At first, the new version sounded too empty, and needed more momentum, but it is now well on its way with what I hope are the right sounds and effects. This time, without the clutter, you can hear the lyrics better, and feel the message behind them. I think this version does the song a lot more justice than my previous attempts. Something I have been meaning to do for a while is to do a cover song, Stoneygate style. (I play various Suzanne Vega covers on the guitar, but not as ‘Stoneygate’.) So when a musicians’ Facebook group I’m following asked who would be up for doing some cover song swaps, I decided to give it a go. The pairings were random, and the group is based in America, so I thought I’d probably be working with somebody State-side. In the event, the random pairing put me with (cue drumroll) Lynz Crichton, a fantastic singer-songwriter based less than an hour away from me! It was a lovely surprise to be paired with someone so close by, with the added bonus of a future meet-up for a coffee. (A Midlands-based Brit also organised the cover song swaps… watch out world, we Midlander musicians are taking over!). I thought it would be cool to share a little of the process with you. The first thing I did was to listen to Lynz’s EP on bandcamp, check out the lyrics, and sleep on it. I still had an earworm the next day with the song that had stood out, One Fine Day. Having another listen to the EP and reviewing all the lyrics helped confirm my choice. Once I’d decided on the song, I could map out the structure and chords of Lynz’s original song in my digital audio workstation. I wasn’t sure about a couple of chords, and Lynz also very kindly let me have a chordsheet to check my work against. The key was not very keyboard friendly, as the song was originally written for guitar. That was going to slow me down for writing parts, so I transposed it up a semi-tone, at a very early stage, and checked it was still going to be within my vocal range. I also messed around with the tempo a bit, slowing it down to bring out the song’s full drama. After that, I could set to work constructing an arrangement around the original song and record a guide vocal as a place-holder. My intention was to make it into a trip-hop version, but my first attempt with the arrangement felt somewhat disco-ey. It wasn’t that I disliked it, it was just that it wasn’t the vision that I’d got for it… I mentioned this to the swap organiser in our Facebook group, and he happened to mention Portishead. That got me back having a quick listen to Glory Box to check up on and confirm my suspicion that my bassline was the main culprit for the song having the wrong feel to it. It was just too bouncy. I wrote a new bassline, stripping it right back so that it wouldn’t attract so much attention to itself. It was better, but the song now felt like it was missing something to really give it atmosphere. I tried adding some strings at key points in the song where there was space for them, messing up the chords so they felt more jazzy and retro. (This is what has given the song its James Bond overtones.) Now the song was really coming together. Time for proper vocal takes, some more tweaks and mixing. I released my cover in May 2018, on the Survival album. Lynz is covering Silver Bird, by the way, and I’ve heard a draft already, with some awesome vocals. Watch this space! Quite possibly against my better judgement, I’ve decided to have another go at the Tune-A-Day-June challenge this year. I don’t honestly expect at this point that I will last above a week, as I have just recovered from a nasty cold and am still getting tired more quickly than normal. But I might just surprise myself and get beyond a fortnight. The Tune-A-Day-June challenge is basically exactly what it sounds like – the idea is to write a new tune every day throughout the month, publishing the better ones on Soundcloud. My first year at this challenge was a couple of years ago, when my friend Max mentioned it, and I decided to join in. I lasted almost the whole month, with a bit of cheating on a few days where I made two tunes to catch up for the odd lost day. Last year, I managed to keep going for about a fortnight, if I remember right. The challenge tends to start off OK then begins to feel more and more like an endurance test. I actually did a couple of warm up writing exercises this year, ahead of June, because I was feeling a bit rusty, having spent a lot of time trying to promote my work and not so much time writing of late. There seems to be a lot of psychology involved, as during the challenge, almost everything you make feels like it is below par, because of the rush to complete something each and every day and the difficulty of maintaining creativity over a sustained period – discipline not really being creativity’s most obvious friend. I don’t have the time to produce more than a working demo of each track – sometimes, I don’t even get that far. It can feel unsatisfying to not reach a finished arrangement or mix. But, looking back over what I’ve produced during June in the last couple of years, it has been a very useful exercise and pushed me out of my comfort zone. With hindsight, it has given at least the beginnings of several of my album tracks and some that will very likely be included on future albums, so it has been incredibly worthwhile, even if it has felt rather painful at the time. Several of the tracks I made last year have received quite a promising reception on Soundcloud. The most surprising response being to Toil, which I posted rather reluctantly at the time, feeling it wasn’t really good enough to upload. So, on the basis that it will be good for me, I’ll likely be driving myself a little bit crazy over the next few weeks as I scramble to meet the daily deadline, probably stretching it into the wee small hours before I go to sleep. The first tune of the month, Dystopia, is now up on Soundcloud…. more to come! 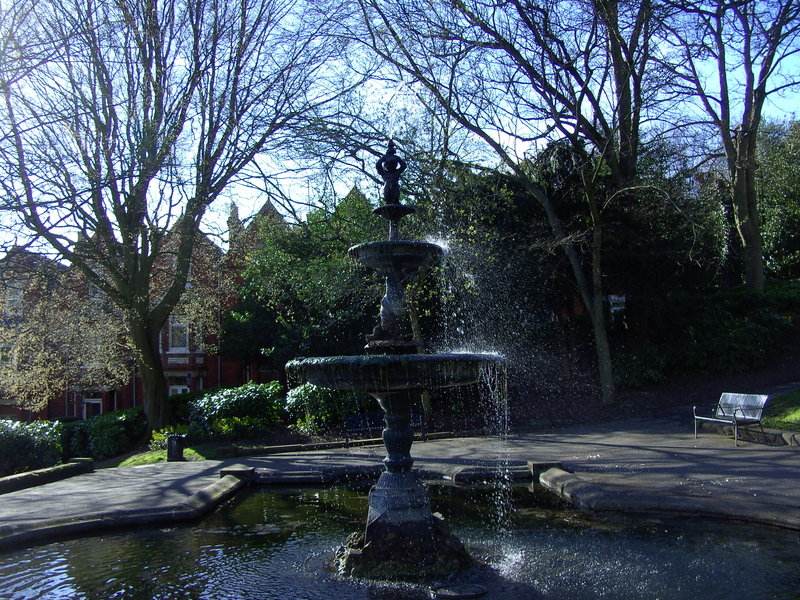 Fountain in Lincoln Arboretum. (I’ve never been to Niagara Falls, so have no photos of it that I own the copyright for). Earlier this week, battling a migraine, I tried to take stock of what material I have for Albums 2 & 3 and get myself a bit more organised towards getting these both out of the door. There’s already quite a lot of potential material for Album 3, but the styles are rather mixed, so I could need to prune it back drastically to make it a coherent body of work, and I may, therefore, need to write some more new tunes to make it hold together better. There is a huge amount of work that still needs doing on most of the tracks for Album 3: many are in just the early stages of production and some are currently just a loop of an idea. When the migraine had subsided, I finalised the lyrics & I put down guide vocals for another new song Thieving Autumn^. This song has been in the writing stage since about September last year. I was really pleased with how the vocals went and may even use them as the final vocals with a few tweaks, if I’m not satisfied with how a ‘proper’ recording goes using a condenser mic. I’ve been arranging a new song that I’m calling ‘Niagara’ this afternoon, and recording some vocals – it has gone from being just a snippet with the main ideas in to a full demo. It’s not easy to sing this one in tune all the way through (I have failed thus far) so I’ll need to practice it a lot more to get the required level of pitch control in the parts that are going wrong. I also realised today that I have another couple of songs I forgot to include on my list of potential tracks for Album 3. Ooops! With the work on Niagara today, that brings the total duration of the demo tracks to 1hr . It’s starting to look like I could end up with more than an album’s worth of material. There seem to be a couple of different overall genres which don’t necessarily complement each other. Basically, it’s 70s influence and indie-folk-electronica versus 80s synthwave and its progeny. It’s not clear how it will pan out though (no pun intended) as the draft playlist I created doesn’t clash as violently as it threatened. ^Thieving Autumn was provided as an instrumental exclusive with last month’s email news. If you’re not yet on the email list, sign up so you don’t miss out! I only send one email out around every month or so. With definite emphasis on the ‘or so’.